I was alone in the open air Hindu temple at Pura Luhur in Bali when I came across this offering on the steps to an altar. 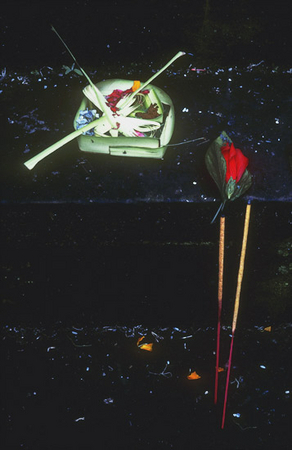 The Balinese put out these offerings three times a day. The basket is made out of a banana leaf and filled with rice, flower petals, and betel nut and placed on altars for the gods and on the ground for the demons. They believe that the good and the bad are constantly duking it out, that we are in the middle, and that it is important to appease both sides. I knew I would like the image and, after making the exposure, decided to take one more at a different setting to be sure that at least one would be just right. At that moment a bee started to pester me and would not let me take the photograph. After several minutes, I finally got rid of the bee and went back to the camera to advance the film to take the next photograph only to find that the shutter was jammed and the film would not advance. The camera was broken so I took it off my tripod and went to get another camera out of my pack. Just then it started to pour. It had not rained in Bali in 5 months and suddenly it clouded over and poured. The message was clear -- the gods didn't want me to take another exposure. One was all I was allowed. So I packed up. As I was leaving I heard a swooshing sound coming from under the roofing of a platform where the Gamelan orchestra would play during a ceremony. I looked for a bird or a bat, but I couldn't see any animal that might have produced the sound. As I got back to the car, my wife Judith had inadvertently closed the door on our guide's hand as he helped her to get in to avoid the downpour. We got out of there as fast as possible before more damage was done. Ten minutes later it was sunny again. That evening, Judith was reading in the guide book about the temple and learned that it had been destroyed by a Raja in the 18th century. The next day he and his soldiers were attacked by a swarm of bees! In addition, a mythological tiger was said to inhabit the jungle around the temple (the "swooshing" I heard was its tail perhaps?). It is also said that many people visiting that temple get a very eerie feeling from the spirits there. Well, I was one of them and felt privileged to be able to experience it. It is one of my favorite prints and I pay homage to the spirits regularly. Frankly, however, I am very nervous every time I print it. I'm concerned that the spirits are going to want the slide back before I'm ready to part with it.